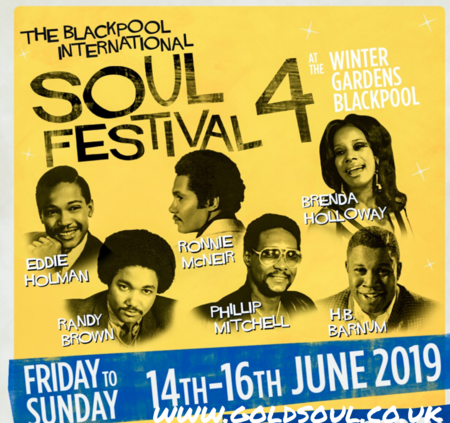 The 4th Blackpool International Soul Festival takes place at the Winter Gardens, Blackpool over the weekend of Friday - Sunday June 14th - 16th, 2019. The 4th Blackpool International Soul Festival is now confirmed to take place at the Winter Gardens, Blackpool over the weekend of Friday - Sunday June 15th - 17th, 2019. Starring EDDIE HOLMAN, BRENDA HOLLOWAY, HB BARNUM, RANDY BROWN, PRINCE PHILIP MITCHELL, 7 Arenas, 50 DJ's. Details regarding DJ line ups will be announced shortly. 3-day tickets priced at only £50 (plus a booking fee and subject to availability) are available now. At the world famous Winter Gardens, BLACKPOOL. The Winter Gardens, Church St, Blackpool, FY1 1HW. Get the FREE Goldsoul App for the Iphone/Ipad or listen via Tunein app. End Date: June 16, 2019.